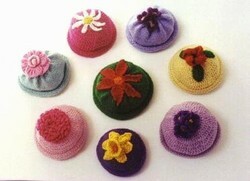 Adorable caps topped with flowers for newborns and toddlers. Knit or crochet the caps in sport or worsted weight yarns. Flowers and leaves are crocheted.